Sunday, January 23rd, was anything but a typical Sunday. At the time I would have normally been sitting in church, I was on my front porch shoveling snow. The Washington DC area had just been blitzed with 20-30 inches of snow in the previous 48 hours. My unofficial measurement taken in the driveway was almost 25 inches, but it was difficult to get an accurate measurement because of the drifting. 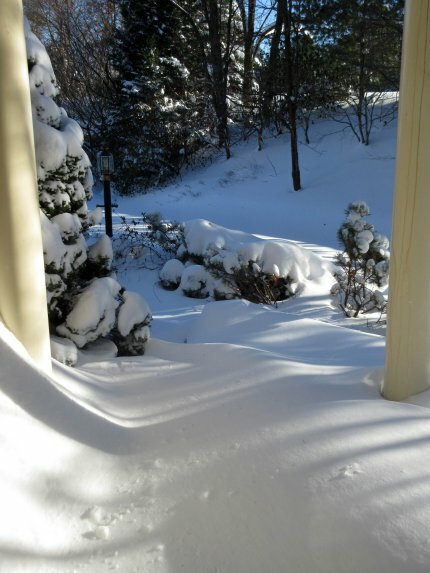 Somewhere under all this snow there is a front porch. Just about everything was closed or cancelled that weekend. We were supposed to have had stake conference that weekend, but the visiting authority had no desire to fly into the predicted mess, so he had wisely postponed it until February. There was some talk that we might have just a Sacrament Meeting in our building, but that was also canceled when they determined the storm was going to be as big as predicted. It was a very surreal experience being on my front porch. That porch is only about 30 feet from a major roadway, and I suspect thousands of cars drive by there on a typical day. But on this morning, I could count the passing vehicles on one hand. The few that I did see were mainly service vehicles, like snow plows or power company trucks. The blanket of snow also had a quieting effect, so even the few vehicles that drove by could hardly be heard. For some reason my neighbors didn't seem to share my enthusiasm for shoveling snow. My house is at the end of the street, slightly elevated, so I have a pretty good view of the entire street. Yet I could not see even one other neighbor outside. It was just me, and the snow and the silence. It reminded me of those old science fiction movies where the entire population disappears except for one person. It was just me and the entire Earth, wrapped in a blanket of white. Well, it wasn't total silence. Hanging from the front porch was a wind chime that was tinkling gently in the breeze. When the snow had fallen, it was accompanied by a blizzard, with winds as high as 40 MPH. But by Sunday the blizzard winds had been replaced by a gentle breeze, just strong enough to make some sweet music on the wind chimes. 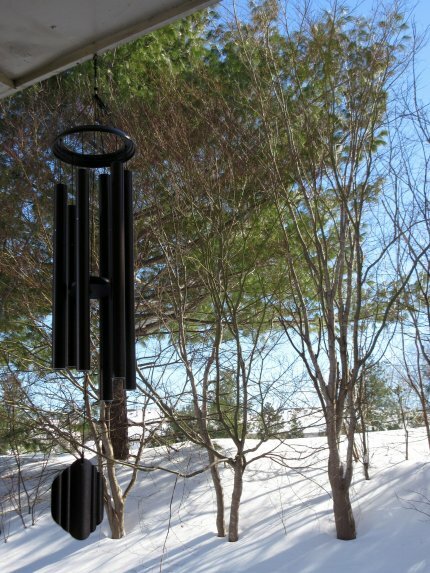 This wind chime made beautiful music for me as I worked to remove the snow. In the beauty and silence of the day, I thought about the gentle sounds of the chimes. Even though they were random, they were like a beautiful performance. It was probably a combination of sounds that had never been heard before and that would never be heard again in exactly that combination. I felt like God had composed an individual symphony for me and me alone. I felt loved and content; more loved and content than I had felt for the previous five weeks. You see, it was just about five weeks previous that my sweet wife, Kathryn H. Kidd, had departed the Earth suddenly to start the next phase of her great adventure. Part of me cannot believe it was that long ago, and yet part of me can remember every one of those sad days. Kathy's life had certainly been filled with a whole smorgasbord of health problems, but we didn't consider any of them to be life threatening. In fact, one week prior to her death we had visited the doctor, and were optimistic about his diagnosis. He said both her heart and lungs sounded just fine. Since her 2012 hospitalization, she had struggled with paralysis in her legs, but was making gradual progress there as well. Her health had never completely returned, but she was well enough that we could still enjoy our lives together and have some semblance of a normal life. Over these past weeks I have often pondered what would be the "preferred' way of death - to have a long agonizing death, or to depart quickly, as Kathy did. I suppose the quick way was best for her, but not so great for those she left behind. We had just celebrated our 39th anniversary, and we had known each other for a couple of years before that. We had a few occasions when we were apart for several days or weeks, but most of those 40 years we had spent each day together. It would an understatement to say that having her suddenly removed from my life has been a major adjustment. Yet even in the midst of great sorrow, God has been there for me, as He always has been. Kathy has written before about what we Mormons call the tender mercies of the Lord, and I have seen many of them recently. As the news of her death spread, many people said they were praying for me, and I could feel the comfort of those prayers. They started pulling me out of that deep abyss where I had been since her departure. As I knew they would be, the members of my ward have been terrific. I had multiple invitations to events on the major holidays (Christmas Eve, Christmas, New Year's Eve, New Year's Day), where it would have been sad to be home by myself. I have been invited to many meals, and had a lot of food delivered to my home. It was so much food that I put much of it in the freezer, and am still working on the leftovers! The other singles in the ward almost immediately started inviting me to their formal events, plus spontaneous informal gatherings. Some of us even went out to dinner the night before the big storm, so that we could do some socializing before being snowed in. Ward members were also so helpful in planning and participating in the funeral. Planning a funeral is one of the worst experiences in the world, because you have to make many decisions and orchestrate a complex event during a time where you are felling stressed and sad. Yet my ward members were all so gracious in being willing to do what was asked of them, plus offering to help in ways that I had not even considered. 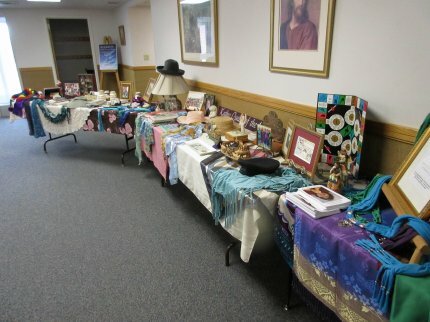 These tables were set up at the funeral to celebrate Kathy's life and her achievements. Another tender mercy happened on a morning when I was feeling particularly sad. The house was very quiet, and I was really missing Kathy. I wished that I could hear her voice again. Just then I noticed that the light was blinking on the phone, meaning that I had a new voice message. In trying to play the message, I was informed that there was an older message that could no longer be saved and had to be dealt with before I could listen to the new message. Imagine my surprise when I played that old message and heard my sweet Kathy. It was an old message that she left me when she was in the hospital in November. I was not home when she called, but I had saved the message and then forgotten about it. I transferred the message from the phone to a computer sound file, and put an icon on my desktop that links to it. Now when I miss her voice I just click on the icon and get a little burst of Kathy. I must have listened to that little clip 100 times, and it always makes me smile. One good thing about being a writer is that they leave many of their ideas and thoughts behind them. I have also taken comfort from reading the 15+ books that Kathy authored or co-authored, as well as the almost 500 blog entries that she wrote since starting her Planet Kathy blog in 2011. Since May of 2012, those blogs have also appeared in the Nauvoo Times. Much of Kathy's zest for life came through in her writing, so reading her work also makes me feel close to her, and I feel like she is sitting there beside me smiling and laughing along with me as I read her words. I have also started working my regular weekly shift at the temple again, and that always makes me happy. There is always such a feeling of peace and joy to be found there, along with the friendship of yet another "family" that I see once a week. Because Kathy and I worked there weekly for more than 20 years, I also feel her spirit and her love there, too. Sometimes I can imagine her walking the halls or sitting at her desk in the office. But I don't see the "old" Kathy who was wearing her support stockings and sitting in her wheelchair. I see the "new, improved" Kathy, who is a singing, dancing, laughing, gorgeous woman. Kathy never feared death, and she wrote about that often (see here and here). She looked forward to it as the next great adventure, and I hope she was not disappointed. Those of us left behind are sad, but we're also happy to think that she is now free from pain and free from the limitations of a physical body that often went contrary to her wishes. I'm excited that she has moved on to an existence where she can be happier and more effective than before. So even though I miss her terribly, I realize that this is part of the Lord's plan, and is for the greater good. I'm sure she is having a wonderful time socializing with her family and friends who preceded her down that tunnel of light. I have read that quote often, and have taken great comfort from it. If great suffering precedes great reward, then certainly I have been much blessed by God. It has now been slightly more than a week since "Snowmageddon" dumped all that snow and paralyzed my neighborhood. When the snow was falling, I wondered if we would ever see the sun or the ground again. First the sidewalks disappeared. Then the roadways, then the mailbox, and then entire cars were turned into giant snowballs. Yet slowly, one day at a time, things are getting back to normal. The sidewalks and roadways are pretty much clear, and people can escape their houses again. The sky is blue, the sun is shining, and the snow is melting. They are picking up the trash cans again, and mail is being delivered again. Soon the snow will all be gone. Then the temperatures will get warmer, the days will get longer, the leaves will appear on the trees again, and beautiful flowers will pop out of the ground. We will turn off the furnace and put away our winter clothes. We will turn on the air conditioner and break out our swimming suits and beach clothes. But then autumn will arrive, and then colder days and more snow. This is the great cycle of life and death, and whether we like it or not, we are all participants. Most of us handle the "life" part pretty well, but the other part of the cycle is more problematic. It is during the sad times that we realize Christ's atonement is more than just an abstract concept. It is the lifeline that connects this world to the next, and will eventually reunite us with those who are now temporarily gone from our lives. With that lifeline and our faith, we can endure the bad times one day at a time, and make it through to a brighter day when the Lord will wipe away our tears and we will sorrow no more. Many who could not attend Kathy's funeral have wondered if parts of it were available online. I have posted many of the talks, plus some pictures and a copy of the program here. My tribute to her and a copy of the obituary can be found here. It was a wonderful funeral with a lot of laughter, and was indeed a celebration of the life of a remarkable woman. I think Kathy was there in spirit, and I hoped she enjoyed our tribute to her and her wonderful life.